And A Player To Be Named Later: Should The Mets Trade Jose Reyes? Until recently, the Mets were hard in "Win Now" mode. They spent beau coup bucks on Johan Santana, dropped 16 mil per on Jason Bay, signed oldsters Gary Sheffield and Gary Matthews to help compete in the NL East and signed K-Rod for serious coin. With Mets management having to cut costs due to the Ponzi scheme they got suckered in, and more importantly, their inability to keep up with the Phillies, the Metropolitans are in rebuild mode. 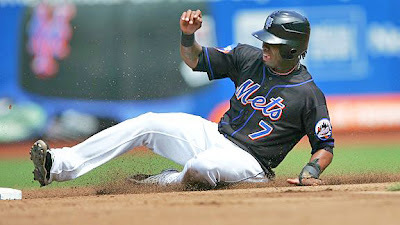 With that the case, the question comes, do the Mets trade their most valuable trade chip, Jose Reyes, for prospects. Or do they try to sign him to a big, long-term deal? The good news for the Mets is that their payroll for 2012 plummets from 2011's 135 million dollar payroll. As of now, the Mets payroll for 2012 is 64 million—even with a bump in Reyes pay to say, 17 million per, the Mets would still be well under 2011's payroll. And considering that the Mets would likely be playing with more prospects, the payroll shouldn't jump too much higher than that. Reyes turns 28 in a few weeks—the prime of his career—and is fully healthy. He's batting .322, has 16 stolen bases already, and can still go pick it deep in the hole. He is the kind of guy most franchises would want to build around. That said, both Ken Rosenthal of FoxSports.com and Rob Parker of ESPN.com feel the Mets should trade Reyes...this minute...and not wait for the deadline. Rosenthal feels that the Mets have shortstop prospects in their system and that getting rid of a burdensome contract while rebuilding would benefit the Mets. "The idea of trading Reyes would be to acquire additional prospects with the goal of building a more well-rounded club." Parker feels the Mets need to be blown up and rebuilt and Reyes (and Wright) "...represent(s) what went wrong, not right with the Mets. It's hard to look past the historic late-season collapses both autographed by the pair." Also, he posits, "Everyone knows this franchise needs an overhaul...There are no more quick fixes—no magical free-agent signings out there to turn the Mess back into the Mets." Both are valid points. However, other writers, for instance, Thomas Saladino of NJ.com feels that selling Reyes would move the Mets backwards, not forwards. "My belief is that specific injuries should only affect a Franchise for weeks, for months, for a year… tops. Selling away your healthy assets during a time of injury-struggle, will perhaps let the effects of those injuries linger on for years...why is it that the Mets, at this point in the life of their franchise, HAVE to trade him? Why can’t he be a part of the plan moving forward?" Ultimately it seems, the argument comes down to this: Do the Mets see themselves as competitive in the next few years, before presumably, Reyes skills begin to decline at 33 or 34. (Reyes has had some injuries, which could contribute to his skills declining sooner rather than later.) Do they play again at a high level within that time? Does Wright become the leader he needs to be? Does Jason Bay ever show up? Does Santana come back healthy and dominate? Is Ike Davis for real? Can the Mets fill out their pitching rotation with some nice prospects? Will the team be a genuine contender, thus making Reyes invaluable as part of the puzzle? If you feel the answers to these are yes, then sign Reyes to a 5-6 year deal at about 17 per. But if you think that the Mets are not projectable serious contenders in the near future and have too many holes to fill, then trade Reyes for the best prospects you can get from a team desperate for an All-Star SS with serious lead-off capabilities. The Giants are salivating over a chance to get Reyes. And the Reds in a dogfight with the Cards would love to get Reyes hitting at the top of the order. 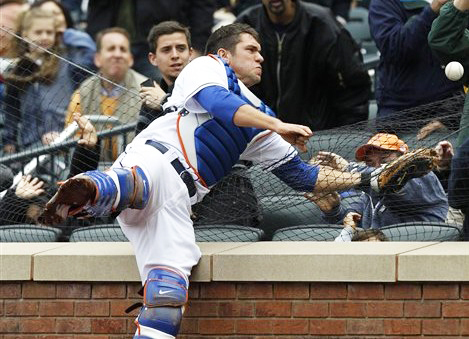 Truth is, the Mets have a lot of holes to fill. Their outfield is a muddle of over-priced, over-aged and never-will-bes. Their rotation is a mess of spare parts. Their second baseman is actually a terrible leftfielder and 1st baseman who's averaged declined 80 points in 2 years. Their catcher is batting .220 and leads the league in passed balls. If it were my club, I'd trade Reyes for a ransom. He's a potential franchise player when healthy and in a better lineup, he could be deadly. The Mets need to plug some of the gaping holes in their roster and can punch in anybody at shortstop until uber-prospect Wilmer Flores is ready. San Francisco would trade the Golden Gate Bridge for Reyes....so Mets, trade him—and Beltran and K-Rod—and start over.